- interactive tests performed on the computer. 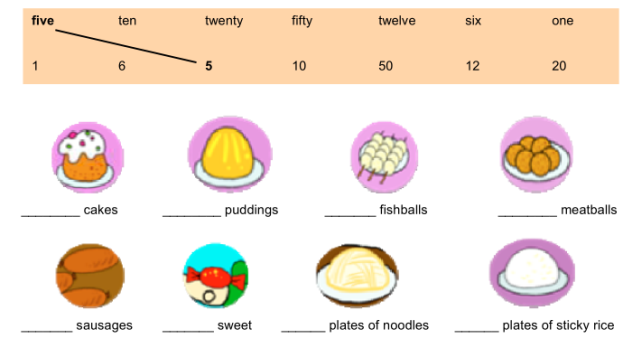 food, worksheets http://learnenglishkids.britishcouncil.org/en/worksheets/food-flashcards diplomas, a computer program "Multi Tester"
I. Organizing a lesson. Greetings. T: During this lesson you will deepen and widen your knowledge on the topic given. But first, look at this sand-glass. What are your expectations of the lesson? Write them down on these sheets of paper and stick them to the top of the sand-glass. Teacher: It’s time to say “Good morning!” And start our lesson. Pupils: He is a hungry dragon. Teacher: How are you, Dragon? What are you going to do now? 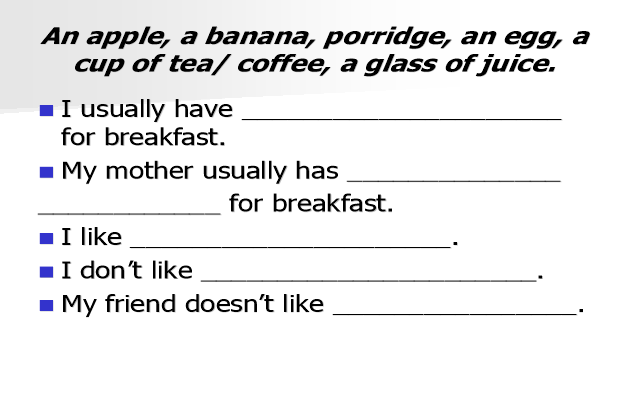 Dragon: Well I am really hungry I would like to invite our children to “Food Quiz” to the British Council. Teacher: Really? When is it? “Food Quiz”, test your food knowledge and decide who can cook the tastiest, the most exotic and the best food for me. They will get these diplomas. He introduces the teams and the captains. Then the rules are explained: the Quiz consists of five parts. In them teams will get points for the right answers. Dragon: Don’t forget to say “Bingo” to be the first! How do you count uncountable nouns? You can't, but you can measure them. You have to use “counters”! Teacher: I say nouns and the groups in turn add "how much" or "how many". Dragon: Each correct answer gets 1 point. The group with the most points is the winner in this activity. Group B S1 how much cheese? Group A S2 : how many water? Teacher: Wrong! "How much water?" Group A gets no point. Group B S1 : how many eggs? 1. How much / How many bread do you want? 2. How much / How many eggs are there in the fridge? 3. How much / How many biscuits have you got? 4. How much / How many milk do you want? 5. How much / How many butter is there on the plate? 6. How much / How many glasses are there on the table? Dragon: Do you like chicken, rice and peas? Do you like chocolate cake? Do you like blackcurrant juice? Pupils: We do! And Sing this song all about yummy food for you. Teacher: Play with Friends, we continue Food – Quiz. Do you know your pizza from your curry? Try this food quiz on the computers and test your food knowledge. Dragon: What comments have you typed? Please, comment the game, boys and girls. P1:I just love hamburgers and now I know the first one was made in 1885 because they are yummy and red !!! P2: It was short but very interesting. P3: I like bananas the most famous and popular fruits in the world because they are yummy!!! P4: This is a very useful exercise. I’ve learnt a lot. 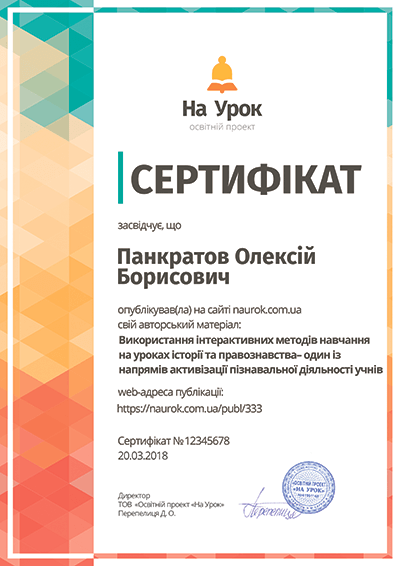 Thank you very much British Council! VI. Summary of the lesson. Dragon: Hurray, children I am still very hungry! Pupils: Let's cook and treat the dragon! P1: Wow, I’ m a super cook! P2: Oh, yes, I’m a good cook! P3: And I’m a hungry cook! 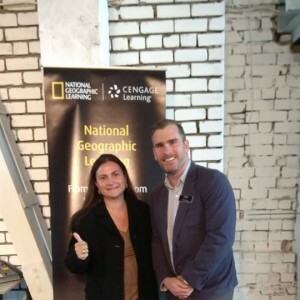 Teacher and Dragon: Thank you for your good work! Your marks are excellent! Take your diplomas and let’s drink some English tea together.